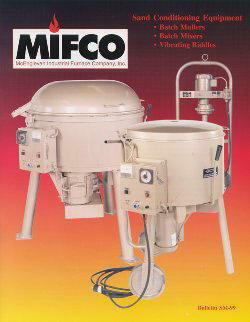 MIFCO manufactures three sizes of small Sand Mullers and two sizes of small Sand Mixers. They are available in both Stationary and Portable styles. The sand mullers come in 65 lb., 125 lb., and 250 lb. capacities and are excellent for short or experimental runs. These machines are ruggedly built and can withstand years of continual use with a minimum of maintenance. All MIFCO sand mullers are available with either a start/stop button control or a mull cycle control timer. We offer a VR240 Vibrating Sand Riddle to compliment the mullers. For more information, contact us and our sales staff will contact you to discuss your needs and prepare a customized quote. Oil bonded sand is available in 35 lb buckets.